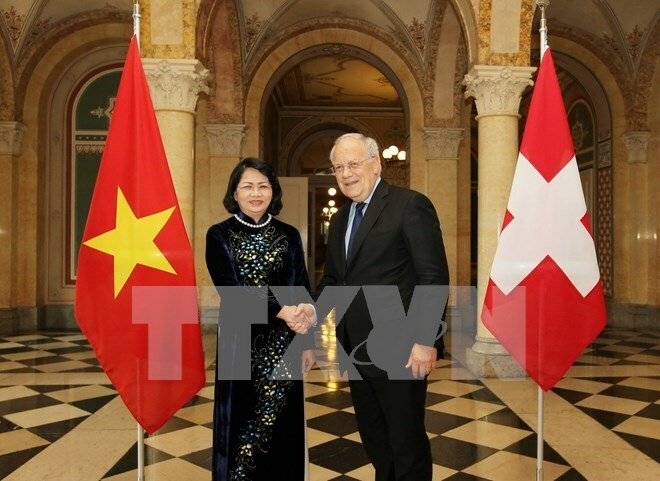 Bern (VNA) – Swiss President Johann Schneider Ammann and Vietnamese Vice President Dang Thi Ngoc Thinh affirmed the importance of ratchet up bilateral cooperation during their meeting in Bern on June 14. Johann Schneider Ammann said Switzerland considers Vietnam a priority partner in Asia-Pacific while Dang Thi Ngoc Thinh expressed her hope for deepened ties. Host and guest agreed on the need to maintain the exchange of all-level delegations and step up the two countries’ coodirnation at multilateral forums and international organisations. The two sides will join hands to organise activities marking the 45 th anniversary of bilateral diplomatic ties. They consented to enhance economic collaboration, focusing on finance, banking, insurance, manufacturing, pharmaceutical products, agriculture and tourism, which are Switzerland’s strengths and sought by Vietnam. The two countries will also strengthen their partnership in education-training and science-technology. Vietnam will create optimal conditions for Swiss businesses to set up their stable and long-term operation in the country, Vice President Thinh pledged. She thanked the Swiss Government for its official development assistance (ODA) describing it a significant contribution to poverty reduction and socio-economic development in Vietnam. President Schneider Ammann stressed that Switzerland wishes to soon conclude the negotiations and signing of a free trade agreement between Vietnam and the European Free Trade Association to which Switzerland is a member, together with Iceland, Norway and Liechtenstein. The President noted his hope that the deal, once effective, will open up new cooperation opportunities for Vietnamese and Swiss enterprises. He noted that along with the ODA, Switzerland will pour more investments in the Southeast Asian nation in the context that the two countries are shifting their development cooperation relationship towards a mutually beneficial partnership. Regarding the East Sea issue, the President shared his concern over the regional situation and voiced his backing of Vietnam’s stance on settling disputes by peaceful measures. The same day, Vice President Thinh met with the staff of the Vietnamese Embassy and representatives of the Vietnamese community in the host country.